Jesse Mulligan gets his barbecue mojo on for charity— and discovers a new wine region in the process. There is art to an event like this. I’m reminded of that every time some half-cooked entrepreneur wins a temporary liquor licence for an uninsulated function centre and calls it a festival. Several hundred people getting drunk in the same room isn’t enough. You need some bunting, at the very least. 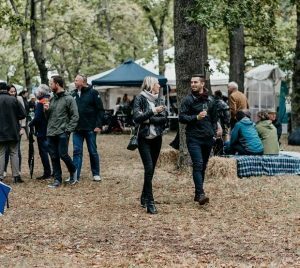 North Canterbury’s wine and food festival shows how special a day like this can be when you get the venue right. It’s held on Glenmark Reserve, a triangle of land 40 minutes north of Christchurch, where the trees are so tall that it doesn’t really matter whether you’re in sunshine or drizzle (both are possible in March). Wandering between the oaks it’s easy to get disoriented and that’s part of the magic — you go searching for smoked ribs but stumble on an ice cream truck instead. You head directly for the petting zoo but end up front of stage at a concert. I was there as a guest of Black Estate, an organic local winery who like to do things differently. Having lured chef Grant Soeburg (ex-French Cafe, Black Barn) to head up their winery restaurant they decided to employ his forces for good on this day of harvest celebration, and together he and I came up with an irresistible recipe for “lamb pops” — minced, spiced lamb cooked on a skewer over coals. (I had lobbied for the name “Dolly Pops”, but nobody else could remember Dolly the sheep and then Grant made the mistake of looking “Dolly Pops” up on Urban Dictionary and let’s just say it is not the sort of definition that makes you hungry). The brief was “hyper local” so we spent the day prior foraging on the side of the road, picking wild mint and sumac which we would stir into a cooling yoghurt sauce. We served the kebabs up two for $10 and all the proceeds went to Rural Support Trust, an organisation that provides mental health support for farmers. “They’ll be calling in extra staff for the capital gains tax,” I joked with a couple of rural-looking types but it was apparently too soon for humour on that one. We raised $2000 over the course of the day which made me feel like the trip had a more noble purpose than just getting local booze into Jesse. My station at the barbecue was also a chance to meet plenty of festival-goers — mostly Christchurch types who’d got on a bus and arrived thirsty. But this would also be a brilliant destination for North Islanders keen to get a feel for the “real” South Island. My kids loved buzzing around the various stalls, breathing deep of the country air and choosing bits of gravel to take home to Auckland. The local wine region rebranded to North Canterbury fairly recently, uniting three smaller areas under one umbrella and, hopefully, doing away with some of the mistaken identity issues that came with the brand Waipara (which, even to New Zealanders, can look a lot like Wairarapa). Though wine geeks are all over it, the region is still largely undiscovered by much of the general public and the festival is a good way to try wine from the biggest names (along with Black Estate these include Pegasus Bay, Bone Island and Terrace Hill) matched with local food and a few restaurants up from the city. The forecast put off a few people this year (13C was the high) but most had booked early and were wrapped up warm enough that the temperature didn’t matter. Even with a coat on there was a natural tendency to huddle round the hottest spots, so the kettle barbecue we were burning attracted plenty of people for a nosey — the odd splatter of lamb fat hitting charcoal didn’t hurt either, and we found ourselves selling lamb pops as fast as we could cook them. But just after the noon rush I managed to steal away and taste some of the best of the rest: slow brisket from Smoke N Barrel, a tiny cornet of duck liver parfait from Inati and non-meaty treats from Grater Goods, a “vegan butchery” run by musician Flip Grater. At the winery stalls pinot noir was popular but the smartest people were ordering one of the brilliant roses, while a couple of winemakers proudly poured albarino, a wine somewhere between chardonnay and sauvignon blanc that is huge in Spain but only just now being cultivated by first adopters in New Zealand.